Today we have news about the HDMI 2.1, which we have spoken on other occasions because of the new possibilities that it offers, and that will be available from today for all manufacturers. 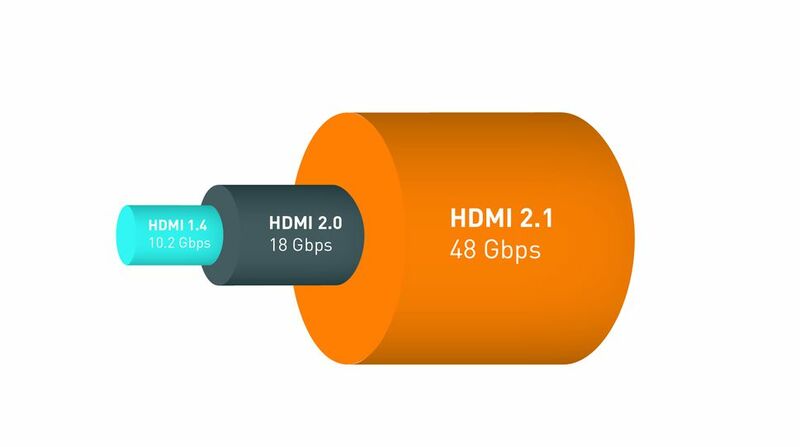 HDMI 2.1 is the standard that the industry needed to start heating up in the face of the emergence of the 8K. The good news is that it will also improve the HDR and the smoothness of the games thanks to the variable refresh rate. The most striking feature of HDMI 2.1, and why it has been most known so far, is its ability to support resolutions of up to 10K. A real barbarity if we take into account that the market is still standardizing the 4K, and that in fact the content available for this resolution, although it is increasingly abundant, is not yet so broad. However HDMI 2.1 will feature other features perhaps less striking but that can provide significant improvements. In addition to the fact that both the ports and the new cable required will be retrocompatible with the previous HDMI standards. The 4K resolution is practically standardized in the market thanks to the fact that for a few years, TVs with that resolution have coped from the mid-range to the top. In addition, releases of consoles with 4K or video recording of smartphones encourage their purchase, so the era that leaves behind Full HD is approaching. However, in preparation for what is coming in the next few years, the HDMI Forum has introduced HDMI 2.1, which brings support to 8K video, dynamic HDR and variable refresh rate. The ability to support 4K resolutions at 120 Hz is one of them, or features such as support for dynamic HDR, lower latency or frame-tearing, which make it ideal for use in video games. What is most surprising is the resolution, since the general public is far away not only from wanting to visualize content in 8K, but also from being able to produce it or having means to reproduce it. HDMI 2.1 is not something that arrives early and badly, but quite the opposite. Thanks to a bandwidth of 48 Gbps, it can support 8K at 60 Hz, unlike when the arrival of the 4K, in which the standard available (HDMI 1.4) was limited to 30 Hz. In addition, it supports 4K to 120 Hz. Its bandwidth will be 48 GB / s of transfer, and to take advantage of it we will need a new HDMI 48G cable. There is still time ahead for us to start seeing it work on the first devices, which will not arrive until next year. But it is good to know that manufacturers already have it and can begin to make the first tests to take advantage of this new technology. 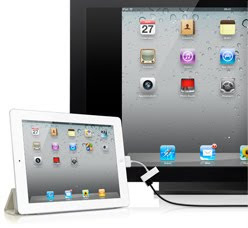 On the occasion of the presentation of the iPad 2, Apple has unveiled a new accessory dedicated initially to the iPad: HDMI adapter that connects an iPad, iPod Touch or iPhone to a screen (HDMI compatible monitors or televisions) . Connected to the iPad 2, the adapter can display the entire screen on a SpringBoard compatible HD in real time. This feature called "video mirroring" is however concerned by the first generation iPhone and iPod Touch, mainly because of a hardware limitation related to the processor (A4 chip for the iPhone 4G / iTouch and A5 dual-core for iPad 2). Without this feature, the adapter can still display on an HD display some native applications. We can then view videos or podcasts from application "Video," presentations or photo slideshows. 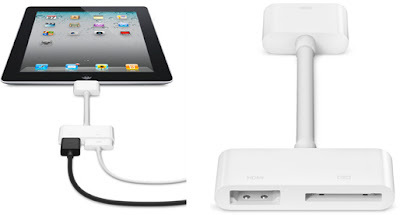 Apple impels consumers to purchase the iPad 2 to enjoy the adapter and the features. One can imagine led conferences from an application repeated on a video projector, or display photo albums on HD television from a friend from a simple iPod Touch! The iPad 2 supports 1080p HD format but can not deliver videos beyond 720p. A 720p video signal is run on other iDevices. There is also support for 5.1 sound in Dolby Surround. The orientation of the accelerometer and iDevice are taken into account by the adapter and transcribed on the screen. The adapter plugs into the dock connector of iDevices, and has two outputs: one HDMI port and a dock connector for recharging. Available in France and 25 other countries for 39 € (the USB charging cable is supplied in the pack). As noted in the test of Gruber, a test more focused on graphics performance. He used a custom application designed by one of the authors of Tap Revenge. It displays hundreds if not thousands of sprites on the screen, moving being influenced by the effects of gravity and trying to keep up to three contacts on the screen. With iPad 1 and 200 sprites, we get 45 frames per second. On the iPad 2, with double, 400 sprites you climb to 65 fps On the iPad 1 it must descend to 100 sprites to 60 fps while the two must put 750 sprites on the screen to fall below 60 fps All this without changing the software code, which bodes well for future applications when they have been optimized. Reading other tests TechCrunch, PC Mag to name a few, led to similar conclusions. 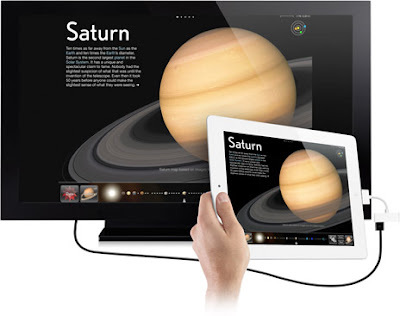 The iPad 2 is a strong evolution of the first model. Not necessarily able to generate alternative vocations, but the product has something to attract the greatest number. Its cameras are judged by all pretty disappointing (by Apple promotes luck rather the use of video), GarageBand amazes even those who have a musical background, then iMovie seems more a scaled down version of its cousin on the Mac. PC Mag has also echoed these crashes with two applications (soon sold € 3.99 each on the App Store). Critical acclaim as the Protection Cover Smart, very smart in how it binds almost alone on the iPad, and no problems with either the HDMI adapter.